Choose from 1 of 2 departure times when you book. 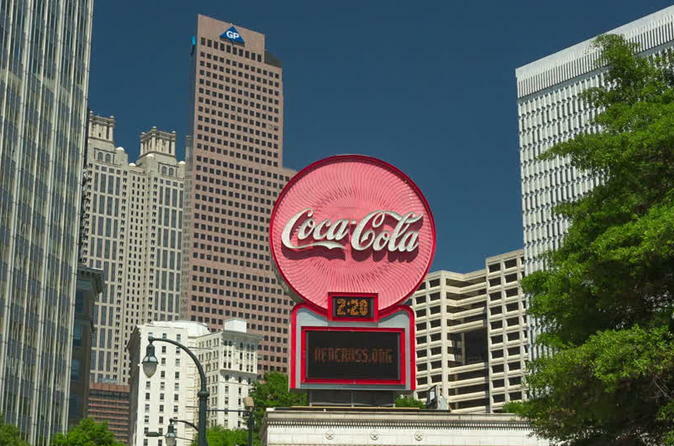 Your 3-hour private tour will reveal how one of the world's most recognizable brands, Coca-Cola, impacted and shaped the history of Atlanta. You may wish to start or end your guided tour at the World of Coca-Cola museum. Meet a private guide at your location in Atlanta for departure at 10am or 2pm, then make your way to a series of sites to explore Coca-Cola's impact on the city. The exact itinerary is customizable, but one favorite destination is the Fairlie-Poplar Historic District, where you can learn about the impact of the families who owned Coca-Cola by visiting the buildings and parks that still carry their names. In downtown Atlanta, see the building that housed the first company to bottle Coca-Cola for distribution, or head to Inman Park, Atlanta’s first planned suburb, with a variety of restored Victorian mansions from the late 19th-century including those of the first two owners of Coca-Cola, the Candlers and the Woodruffs. Candler Park, named after Coca-Cola's founder, is on the National Register of Historic Places, and the Druid Hills, a neighborhood designed by Frederick Law Olmsted, includes the historic mansions of some of Atlanta’s early leading families, including the Candlers. Visit the final resting place for the Candlers and the Woodruffs at Westview Cemetery and Abbey, whose mausoleum is the largest of its kind ever built under one roof, and includes the stunning Abbey Chapel, decked with 27 stained glass panels. This 3-hour tour concludes with drop-off within Atlanta city limits.